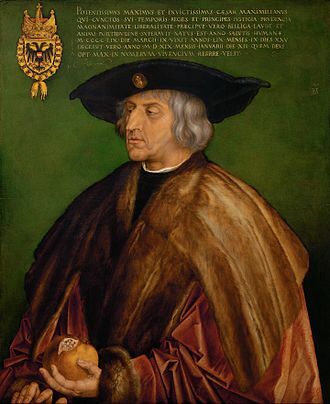 Frederick III (21 September 1415 – 19 August 1493) was Holy Roman Emperor from 1452 until his death. 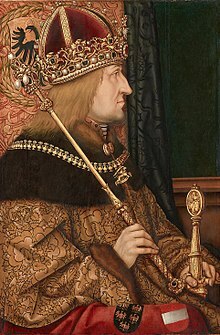 He was the first emperor of the House of Habsburg, and the third member of the House of Habsburg to be elected King of Germany after Rudolph I of Germany and Albert I in the 13th century. 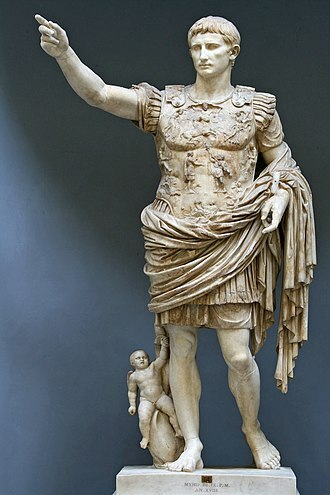 He was the penultimate emperor to be crowned by the Pope, and the last to be crowned in Rome. Elizabeth of Luxembourg was queen consort of Germany and Bohemia. The only child of Holy Roman Emperor Sigismund, King of Hungary and Bohemia, Elizabeth was expected to ascend his thrones along with her husband, Albert of Austria. Her rights were ignored by the Hungarian nobility when Sigismund died in 1437 and only her husband was accepted as monarch, Albert died in 1439, leaving Elizabeth a pregnant dowager with two daughters and Elizabeth. She was determined to contend for her patrimony on her sons behalf, the conflict ended with the queens death at the age of 33. Vladislaus himself died in battle in 1444, opening the path for Elizabeths son to be recognized as king of Hungary, because this feast falls on 4 October, it must have happened in the previous year, that is,1409 and in October. 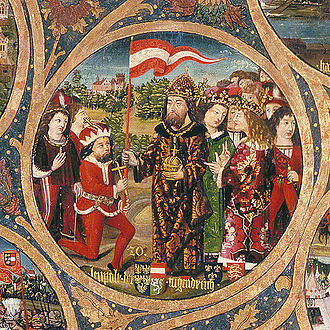 In addition, Itinerary of King Sigismund shows that he stayed in Visegrad between 9–19 October 1409. In the end one concludes that her birth in Prague, on 28 February 1409, Elizabeth was born into the powerful House of Luxembourg. 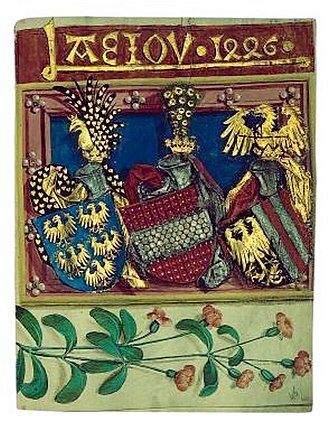 Her parents were the 41-year-old King Sigismund of Hungary and his second wife, hrvoje Vukčić Hrvatinić, the rebellious baron with whom Sigismund had recently come to terms, was the infants godfather. The year after her birth, Elizabeths father was elected king of the Romans, as the kings only child, Elizabeth was seen as de facto heiress presumptive to the throne, or at least as the princess whose eventual marriage would provide a king. 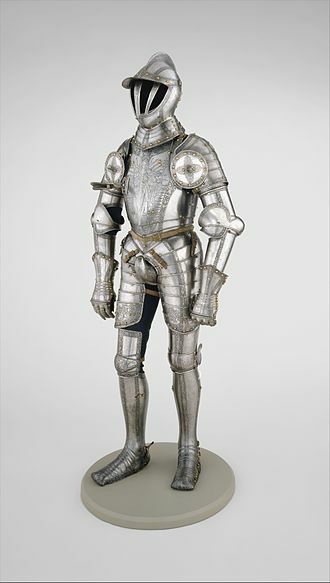 Elizabeths hereditary right was in fact rather slim, as her father had acquired it by marrying his first wife, Queen Mary, the same year, Sigismund betrothed Elizabeth to the Habsburg Duke Albert V of Austria, aged 14. Queen Barbara was very unpopular among the nobility, who resented her sympathy for the Hussites, in 1418, they accused her of having committed adultery while her husband was attending the Council of Constance. 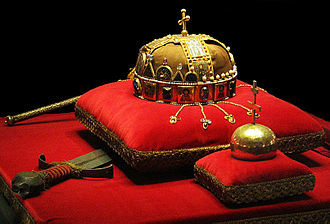 The resulting strain in the marriage led to the queens banishment and confinement, first in Várad and subsequently in Szakolca. Nevertheless, Sigismund simultaneously negotiated her marriage to the Habsburg Duke Albert V of Austria, the Habsburgs, Sigismunds long-standing friends and allies, evidently did not question Elizabeths legitimacy or, at least, were not deterred by the accusations made against her mother. St. Stephens Cathedral is the mother church of the Roman Catholic Archdiocese of Vienna and the seat of the Archbishop of Vienna, Christoph Cardinal Schönborn, OP. Stephens Cathedral.5 metres below the surface, which were carbon-dated to the 4th century and this discovery suggests that an even older religious building on this site predated the St. Although the first structure was completed in 1160, major reconstruction and expansion lasted until 1511, from 1230 to 1245, the initial Romanesque structure was extended westward, the present-day west wall and Romanesque towers date from this period. The anniversary of this second consecration is commemorated each year by a ringing of the Pummerin bell for three minutes in the evening. In 1304, King Albert I ordered a Gothic three-nave choir to be constructed east of the church, under his son Duke Albert II, work continued on the Albertine choir, which was consecrated in 1340 on the 77th anniversary of the previous consecration. The middle nave is dedicated to St.
Stephen and All Saints, while the north and south nave, are dedicated to St. Mary. Duke Rudolf IV, the Founder, Albert IIs son, expanded the choir again to increase the religious clout of Vienna, on 7 April 1359, Rudolf IV laid the cornerstone for a westward Gothic extension of the Albertine choir in the vicinity of the present south tower. This expansion would eventually encapsulate the entirety of the old church, and in 1430, the south tower was completed in 1433, and vaulting of the nave took place from 1446 to 1474. The foundation for a tower was laid in 1450, and construction began under master Lorenz Spenning. 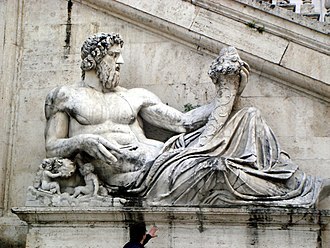 In 1722 during the reign of Karl VI, Pope Innocent XIII elevated the see to an archbishopric, on 12 April 1945, civilian looters lit fires in nearby shops as Soviet Army troops entered the city. The winds carried the fire to the cathedral where it damaged the roof. Fortunately, protective brick shells built around the pulpit, Frederick IIIs tomb, the Rollinger choir stalls, carved in 1487, could not be saved. Kunigunde of Austria was an Austrian Archduchess member of the House of Habsburg and by marriage Duchess of Bavaria-Munich and since 1503 over all Bavaria. She was the daughter of Frederick III, Holy Roman Emperor and his wife Eleanor of Portugal, born in Wiener Neustadt, Kunigunde was the fourth of five children born to the Imperial couple, only she and her older brother Maximilian survived to adulthood. She grew up in an informal and open atmosphere, without rigid court etiquette, contrary to former practice, she learned not only to read and embroider, but received instruction in riding and hunting and mathematics. Like most daughters of families, since her early years Kunigunde was involved in the political intrigues of her time. 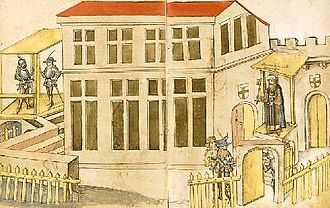 In 1470 King Matthias Corvinus of Hungary requested her hand, however, at the age of fifteen, in 1480, Kunigunde made her formal presentation in Vienna during the visit of George, Duke of Bavaria, called the Rich to Frederick IIIs court. Kunigunde married Albert IV, Duke of Bavaria-Munich in 1487 against the will of her own father, in spite of her resignation from court life, she tried to influence the politics of the state as she acted in favour of the rights of her younger sons. 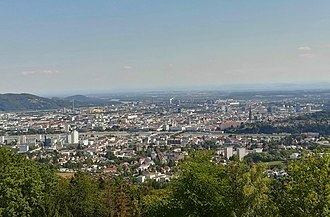 The residence of the Inner Austrian archdukes and stadtholders was at the Burg castle complex in Graz. 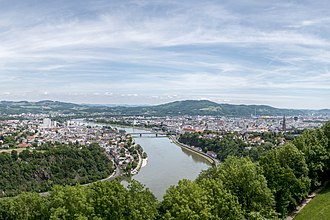 In the west, the Carinthian lands stretched to the Archbishopric of Salzburg and the Habsburg County of Tyrol, while in the east, the Mur River formed the border with the Kingdom of Hungary. 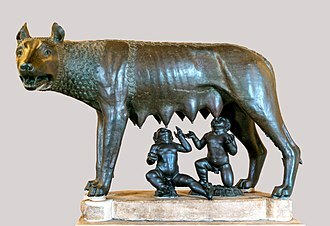 In the south, the County of Görz, which had passed to the House of Habsburg in 1500, the Imperial Free City of Trieste on the Adriatic Coast linked to assorted smaller possessions in the March of Istria around Pazin and the free port of Rijeka in Liburnia. 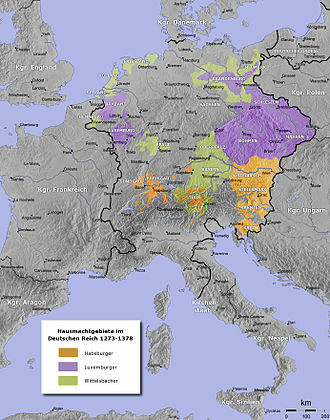 In 1335 Rudolphs grandson Duke Albert II of Austria received the Carinthian duchy with the adjacent March of Carniola at the hands of Emperor Louis the Bavarian as Imperial fiefs. 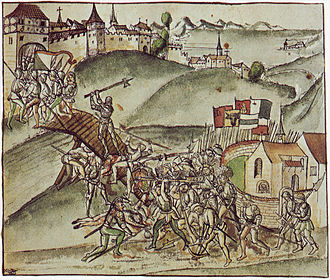 Both sides came to an agreement to maintain the Neuberg division, from 1404 William acted as Austrian regent for his minor nephew Albert V. The Tyrolean and Further Austrian lands passed to Williams younger brother Duke Leopold IV the Fat,1490 saw the reunification of all Habsburg lines, when Archduke Sigismund of Further Austria and Tyrol resigned in favour of Fredericks son Maximilian I. 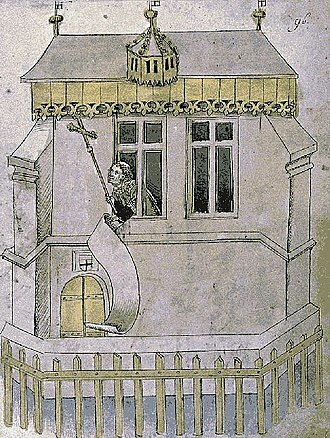 Detail of a miniature of King Philip II of France arriving in the Holy Land. The Vida (text in red) of the medieval troubadours Tomier and Palaizi, who exclusively advocated defence of the Holy Sepulchre. Consequently—in contrast to Lanfranc Cigala—criticising the Albigensian Crusades as distractions, even to the point of resulting in marks of heresy. The Aedicule inside the church, alleged to enclose of the tomb of Jesus Christ. Contemporary Franciscan monks during the procession on the Calvary in the Church of the Holy Sepulchre (2006). 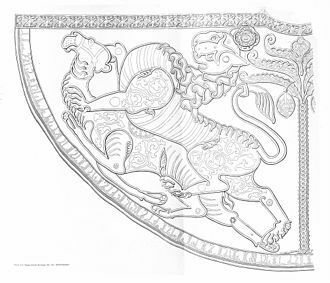 A half guldengroschen from 1484. Betrothal portrait of Ladislaus and Magdalena of France. Frederick III and Eleanor of Portugal. 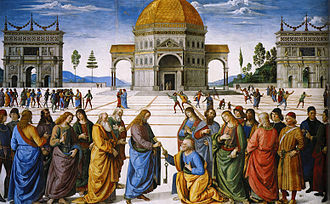 Eneias Silvio Piccolomini (the future Pope Pius II) celebrating the marriage between Frederick III and Eleanor. Elizabeth (left) and Barbara (right) in procession to Constance Cathedral, as illustrated in the Chronicle of the Council of Constance, c. 1440. 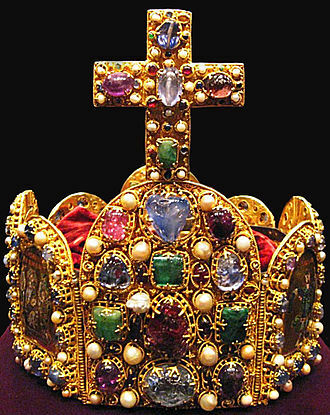 Both mother and daughter are depicted wearing the Holy Crown of Hungary; in reality, Elizabeth was crowned two decades after the Council. Statue in the Hofkirche, Innsbruck.